Scientists have developed a new shoe insole that may heal diabetic ulcers while you walk. Purdue University engineers say that their new shoe insole could help the 15% of Americans with diabetes who develop diabetic ulcers. People with diabetes can develop ulcers that they are not aware of until they notice the bleeding. Ulcers do not heal on their own. That is why fourteen to twenty-four percent of Americans with diabetes end up losing their toes or feet. Some of them even lose a limb. Researchers at Purdue University have developed a new shoe insole that could make the ulcer healing process more portable. (citation below). Ziaie is a Professor of Electrical and Computer Engineering at Purdue’s Birck Nanotechnology Center. Diabetic ulcers are usually due to high blood sugar, which damages nerves. Subsequently, patients lose feeling in their toes or feet. If your toes or feet are numb, you do not notice when they hit things and skin tissue breaks. Eventually, ulcers form. High blood sugar combined with very dry skin further slow the healing process of ulcers. Bell, who works at the Memorial Hospital in Jacksonville, Florida, is the founder of the Save a Leg, Save a Life Foundation. 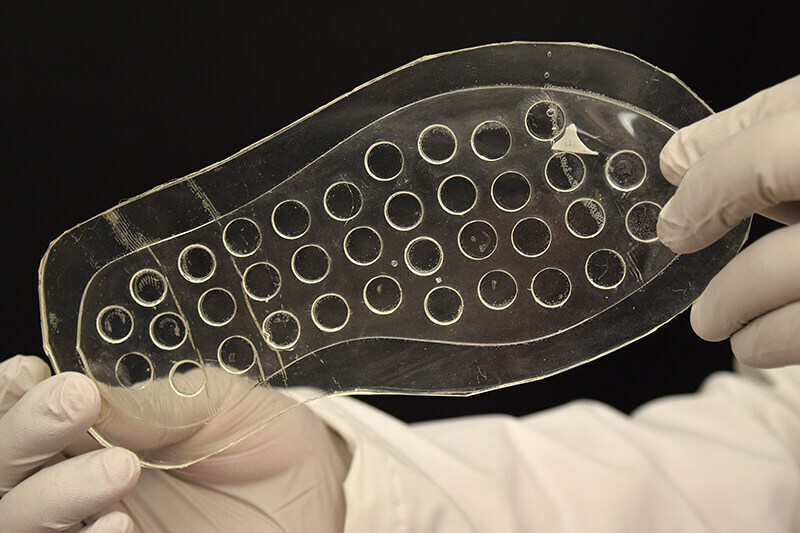 The researchers used lasers to shape the new silicone-based rubber into insoles. They then created reservoirs that release oxygen. However, they only release oxygen in the area of the foot where the ulcer is located. Jiang is a postdoctoral researcher in electrical and computer engineering. The new insole can deliver oxygen for at least eight hours a day under the pressure of somebody weighing 53-to-81 kg (117-119 lbs), according to the team’s simulations. It is also possible to customize the insole to take on any weight, say the scientists. A manufacturer could send patients with diabetic ulcers packs of pre-filled insoles, the researchers envision. 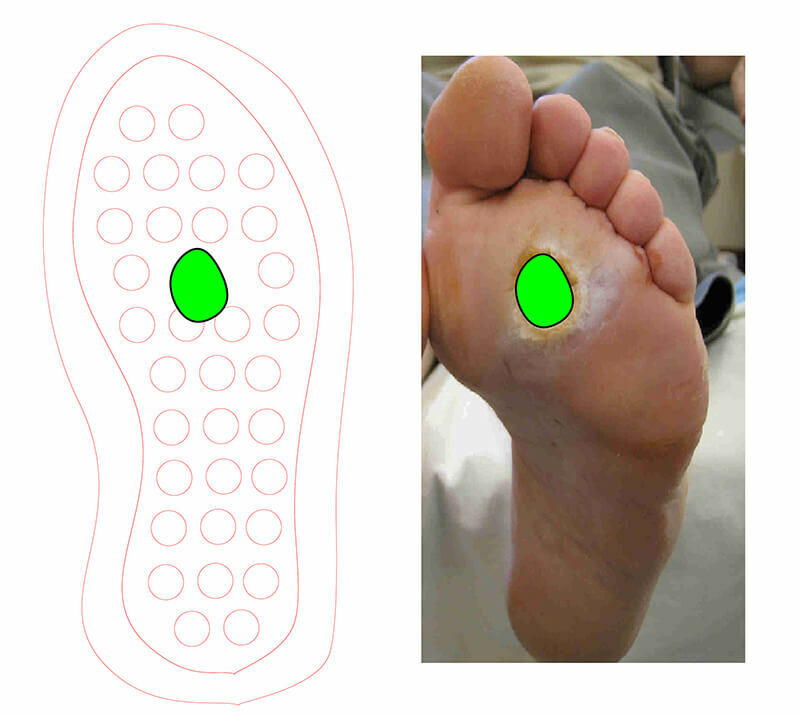 The manufacturer would customize the insoles to the specifics of each patient’s wound site. In other words, the manufacturer would make the insole according to the patients ‘wound profile.’ All the manufacturer needs is doctor’s prescription and a picture of the patient’s foot. Vaibhav Jain, a Research Associate in Electrical and Computer Engineering, said: “This is mass-customization at low cost.” Jain recently graduated from Purdue’s Mechanical Engineering Master’s program. The researchers would like to find a way to 3D print the new insole. 3D printing would be faster than printing a mold and then laser-machining a pattern. They also want to test the insole on real-life diabetic ulcers to further determine how well they speed up the healing process. The NextFlex PC 1.0 Project funded this research. The researchers, who are currently seeking corporate partners, say a patent is pending on the insole technology. A patent is a certificate that protects an inventor or inventors from the illegal sales, copying, or other uses of their invention. “A laser-customizable insole for selective topical oxygen delivery to diabetic foot ulcers,” H. Jiang, M. Ochoa, V. Jain, and B. Ziaie. Materials Research Society Communications Volume 8, Issue 3 September 2018, pp. 1184-1190. DOI: https://doi.org/10.1557/mrc.2018.181.